Darren Mathews has been suspended as a Texas Ranger pending the results of an inquiry regarding his allegedly lying to a grand jury. Yet his FBI friend Greg Heglund, knowing that his interest would be piqued by it, told him of two murders in a small Texas town, the first a Black man from Chicago and second a local white girl. The local sheriff was making the former into a robbery/death and the latter into a domestic dispute of some sort. Knowing however, that the Aryan Brotherhood has a strong hold in the town, made for curiosity. Mathews, despite having to turn in his badge, figures out he has about a day to drive, take a look and return. What he finds reeks of something other than a robbery gone awry. It is a town where everyone knows everyone else and everyone else’s business, where half the town is related to the other half, regardless of skin color and where secrets abound. Being a Black man nosing around, regardless of his law enforcement status, can be dangerous and even deadly. There is the usual repartee between the rogue cop (Mathews) and his boss, the unheeded warnings and the rebukes. There is the credit starved FBI friend. There is the romance gone south. There’s drugs and beatings and racial tension of the south. In other words, all the ingredients of a good mystery. Bluebird, Bluebird, exceeding my high expectations. 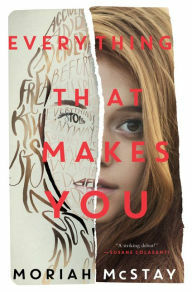 Everything That Makes You by Moriah McStay is a nicely written debut novel. It’s a ‘what-if’ novel. In alternating chapter sections you have Fiona whose face was disfigured by burning oil as a child, Fiona the good student, Fiona the would be singer/songwriter contrasted with the cute Fiona, the athlete, the middling student, the going steady with Marcus Fiona. Everything That Makes You takes you from Fiona’s junior year in high school through to the end of her freshman year at college. The disfigured Fiona’s chapter sections are entitled Fiona while the cute athletic Fiona’s sections are entitled Fi. One would think that when you’re young and cute and athletic, you’ve got the world on a string. You’d be carefree, self confident, flirty and more. But McStay points out that regardless of physical attributes and abilities, everyone has his/her own set of insecurities. Clearly Fiona is not the only person affected by her accident.Her brother Ryan, 10 months older, is a key player in Fiona’s life and the book. Of course you know that somehow the lives of the Fionas intersect (not the Fionas themselves because they are not living in parallel universes but their friends and acquaintances), but I won’t tell you how. McStay does a fine job of portraying an overly protective mother, one who doesn’t listen to her daughter, one who in an effort to forge the best makes her daughter feel incompetent and less. She also has a few secrets stored up as she gets closer to the end. Everything That Makes You is an unusual twist on the ‘what-if’ scenario. It’s a fast read and once you start you won’t want to stop reading. Peter Robinson’s Inspector Banks series never fails to please and In the Dark Places is no exception. Two events form the basis for this exciting, past paced novel. Financial wiz-kid turned ‘weekend farmer’ John Beddoes has just come home from a Mexico vacation to find his expensive tractor stolen. There seems to have been a rash of robberies in the area; farm equipment, farm animals, etc. Simultaneous to this, injured war veteran Terry Gilchrist is out walking his dog Peaches by an abandoned airfield when she scoots under the chain link fence and bounds into the hangar. No amount of whistling and calling will bring her back so Gilchrist is forced to find the hole in the fence, crawl through and search for Peaches. What he finds in addition is something that looks like blood. So he calls the police. Two days later when a lorry carrying stillborn sheep destined for incineration drives over a cliff and human remains are found in the cargo, there is no doubt that the crimes are related. Banks, returning from a vacation of his own in Umbria with the lovely Oriana, and crew get involved in both crimes. When it turns out to be human blood in the hangar, now it’s murder. In the Dark Places probes the meat slaughtering industry, especially the unlicensed abattoirs that might sell to local restaurants. It will clearly stop your digestive juices from flowing and possibly make you consider becoming a vegetarian. The Banks team are all familiar characters and it’s almost as if you can visualize them…maybe you can if you watch the BBC series on Mystery. They have have distinct personalities. There is a little love interest with Winsome and there’s always the push and pull between Annie Cabbot and Banks, which is much different than in the TV series. There’s not much going on with Banks’ family, his son and daughter, only honorable mention, so to speak, although other books have concentrated more on them. And there are no cold cases in this story, while there have been in the past. Music always plays a role in an Inspector Banks book and true to form, it does in this as well. 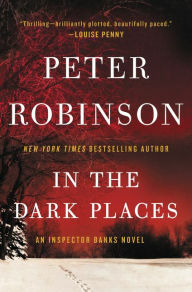 In the Dark Places is an all around good read. A fine continuation of a fine series. 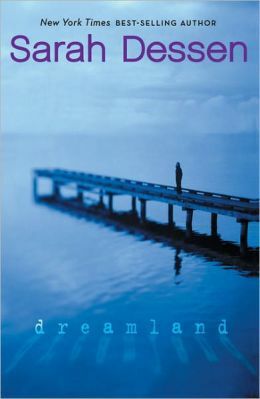 My first Sarah Dessen book was Dreamland, upmteen years ago and I was hooked. It was about an abusive relationship, as was Breathing Underwater by Alex Flinn, which I read shortly after. Both authors have since moved on from topical issues, Flinn to retelling fairy tales and Dessen to summer romance. So I was happy to see that in Saint Anything, Dessen has inched back towards a topical issue. Sixteen year old Sydney Stanford’s older brother Peyton had it all-charm, athleticism, smarts-but for some reason he threw it all away, drinking, breaking and entering, etc. Having served several short stints in jail, he’s now locked away for a longer time for something more serious, drunk driving and hitting a pedestrian. Sydney, in order to avoid knowing eyes and whispers, decides to leave her prestigious private school for the local public school, Jackson High, where nobody knows her. This also meant leaving behind her best friends Jenn and Meredith and their after school coffees, etc. After her first day of school, not wanting to go home to a mother so focused on Peyton, she wanders into a local pizza place. As she opens the door, a good looking guy, Mac, comes in behind her and goes behind the counter. Sitting and eating her pizza, a young blond girl, Layla, rushes in and disappears behind the door marking Private. Little does Sydney know how important these two people will become in her life. This is the second book in a row I’ve read where mothers become overbearing, for one reason or another, and children suffer. Sydney’s mother, Julie, is so focused on making Peyton’s jail time as comfortable and enjoyable as possible (yes, it is jail, not play school) and in making sure that Sydney doesn’t make the same mistakes, that the once lively Julie has become a machine. She’s talking with prisoner advocates, monitoring Sydney’s activities and organizing parents of other inmates, so that Sydney’s once idyllic home life has been obliterated. In addition, Sydney also has to deal with the creepy Ames, a friend of Peyton’s who has wormed his way into the Stanford household as her mother’s friend. His mere presence makes her uncomfortable, but of course, no one notices. 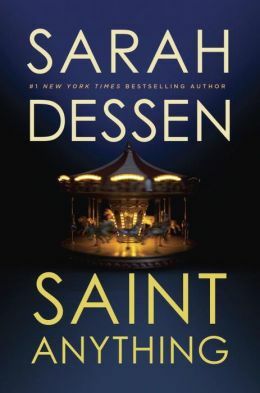 As I said, Saint Anything is a step towards realistic fiction while not losing the summer romance angle that has made Sarah Dessen as popular as she is. 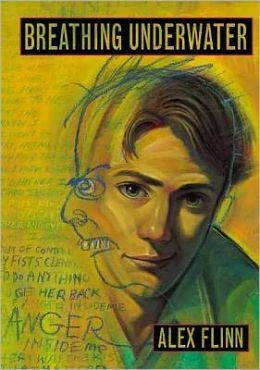 Dessen explores Peyton’s feelings towards his family, the society imposed and self imposed isolation that comes from being in jail. Julie’s transformation from lively, energetic mother to overbearing, focused, disciplinarian, which in part causes Sydney’s feeling of isolation from family and friends, is palpable. I can’t believe that I never published this post. Rising country star seventeen-year-old Lilah (Dee) Montgomery is on her summer tour and takes her best friend, bad-girl Reagan O’Neill with her. Reagan, coming off bad relationships, has resolved to reform beginning this summer. When the tabloids print a photo of Lilah and her ex-boyfriend with hints of her pregnancy, her good-girl image is tarnished. Her publicist signs Matt Finch as an opening act, replacing the local area talents, hoping to divert media attention with speculation that Lilah and Matt are a couple. Matt, in a brother band, the Finch Four, several years earlier, is currently under the radar. His good looks and squeaky clean image are enough to start new rumors. The only problem: no matter how much Reagan tries not to, she’s falling for Matt and vice versa. Can she have a relationship with a ‘good’ guy? If the media finds out, how will that impact Lilah? Open Road Summer, Lord’s debut novel, is truly fun ‘chick-lit’. Lilah, Reagan and Matt are characters readers will immediately like. Lilah’s pain at leaving her ex-boyfriend, who let her go to follow her dream, will pain readers. Reagan’s uncertainty about life and love will resonate with teenage girls, whether ‘good girls’ or ‘bad girls’. Readers will want Matt’s and Reagan’s relationship to thrive. Lord also provides a realistic look at the lengths paparazzi and the media will go to invade a star’s privacy. 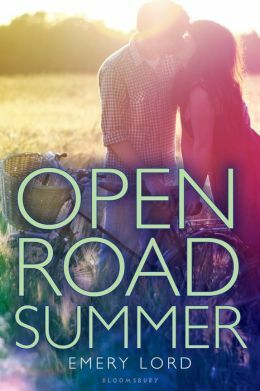 Open Road Summer, published last April, is a well written beach read. And since much of the country is under mounds of snow, tack a picture of the ocean and palm trees on your wall, put some logs in the fireplace to heat up the room and pretend you’re lying on a beach somewhere. By the way, Emery Lord has a new book coming out in March 2015, The Start of Me. I’m ready to give it a go. The Martin children are named after birds: fifteen year old Skylark (Sky) and eleven year old Seagull (Gully). Their mother left them when Sky was 10 to become a performance artist…in Japan. She has little contact with her former family. Their father never moved past the 1970s, owning a record shop that won’t stock anything past 1980, won’t stock CDs and won’t sell on the internet. He spends most days on the verge of drunkenness. Unfortunately these circumstances leave Sky with primary responsibility for Gully who is autistic. He wears a pig snout most of the time which, as you can imagine, doesn’t endear him to his schoolmates. He fancies himself a detective and when a brick is thrown through the store window, he makes it his business to track down the perpetrator. She also helps out at the record store, which doesn’t get much traffic. Sky’s only friend is a world-wise nineteen year old, Nancy. It must be true that opposites attract because Nancy is everything that Sky isn’t. When Mr. Martin hires Luke Casey to work at the store for the Christmas season, Sky is miffed. When it turns out that Luke’s younger sister drowned after drinking and posters of her keep cropping up all over town, Sky is intrigued. The fact that Luke is cute doesn’t hurt. Girl Defective by Simmone Howell is a story about growing up, both teens and adults. Sky must learn what the world is all about (on her own and through Nancy) and her father has to move into the new century and take on his fatherly responsibilities. Howell’s characters are good, although at times I’d like to hammer Mr. Martin for foisting Gully on Sky all the time, and her writing is descriptive, at some points exceptional (“Night fell soft as a shrug. Even the palm trees looked tired, like showgirls standing around waiting for their pay.”). Any story rooted in music is a plus, especially 70s and 80s music. 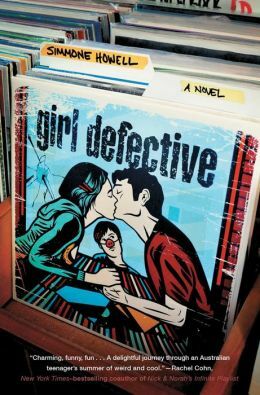 Of course, since this takes place in Australia, I don’t know some of the musical references, but that’s OK.
All in all, Girl Defective is a fun book.